Merci Maman are a company I really love because of their unique designs and personalisation, purchasing from Merci Maman means that no one of their items are ever the same. Merci Maman was set up by Beatrice De Montille 6 years ago, back in 2007. Beatrice's aim was to create a place where you could find a selection of charming, unique and carefully-made gifts. Beatrice wanted gift buying to ultimately be a simple and fun experience, and one where you could always find the most inspirational and wonderful ideas. All of the items that you will see features over at Merci Maman are completely unique and can be personalised with important names, dates and little messages. This is what makes them so special in my opinion, everyone wants something that they can wear close to their hearts, something that actually has some meaning behind it. I have been sent a very beautiful Merci Maman necklace to share with you, as always this necklace is like no other that I have ever seen, and not only does it look stunning but what it represents is truly beautiful. The Gold plated intertwined Necklace is known as the 'Lovers' Necklace because of the personal disks that join them together, symbolizing the connection of two people. The connection could be a husband and wife, boyfriend and girlfriend, Mother and child, or even a Grandparent and Grandchild. The meaning is completely up to the person who is purchasing the necklace and as soon as I saw this I knew exactly who it should be for. Leo's Granny looks after him while I am away at work, and she has always been there to help me with Leo if I need the extra pair of hands. She has been in Leo's life right from the start and even popped into the hospital room minutes after he shot into the world. So this necklace for me, represents Granny's and Leo's connection. 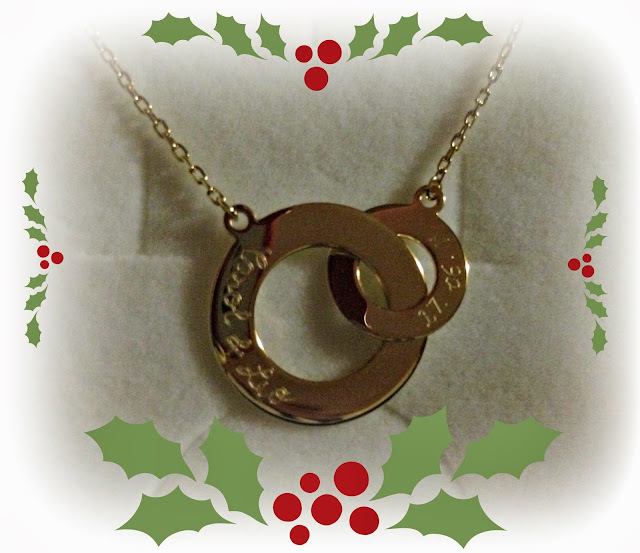 Merci Maman engraved the necklace with Granny's name and Leos, and even Leo's date of birth. It is such a personal design, so simple yet so elegant. The perfect gift to highlight such a special relationship. The dedication to personalisation doesn't just stop at the actual product, it is followed right through to how your chosen gift is presented to you. Granny's necklace arrived in a complimentary gift box, and tied with a bow. For a small charge you can even add a gift card to accompany your personalised gift. I absolutely love this necklace and I know that Leo's Granny will too. I will cover that in another post at a later date. If you are looking for a really personal Christmas gift this year, I highly recommend checking out Merci Maman and the rest of their collection. The prices are all very reasonable and the inscriptions that you have engraved are all included within that price. The Lovers Necklace is £79 which I honestly think is a great price and certainly doesn't break the bank, but will put a big smile on the recipients face. 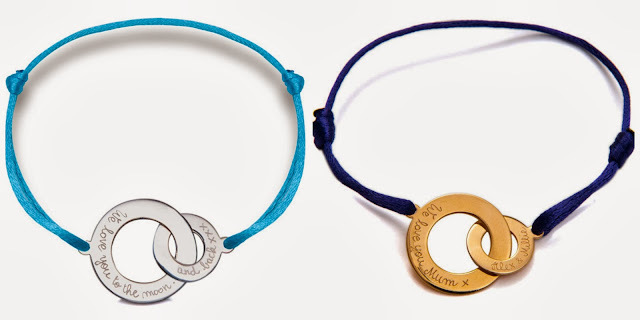 Merci Maman are offering one lucky reader the chance to win a Personalised Intertwined Bracelet in their choice of either Gold or Silver plating. The winner will be able to have it inscribed with their own personal names and dates, and it would be a great Christmas gift for someone special. All you have to do in order to be in with a chance of winning this beautiful bracelet is follow the Rafflecopter below. 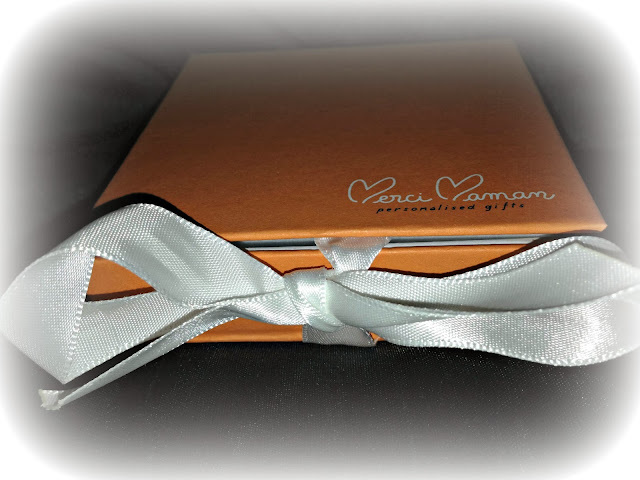 Disclaimer: I was sent the Merci Maman Lovers Necklace for the purpose of this review. All thoughts and opinions expressed are completely honest and my own. I would love a bracelet which represents my three children... but this one, this would be for my mum. I would love to win this for myself because I think the bracelets are beautiful! I would love this for myself! Love personalised gifts! What a unique gift, my nephew was due to be born this week, so he is keeping us all waiting. This would be a lovely gift for a new mum and her first born. As a Christmas present, I would give it to my sister. I would give it to my daughter and would like to win because it's so pretty. I'd like to win it for my little boys mamgu who has been having a tough time of late. I'd keep it for myself! It's lovely! it's a beautiful bracelet, and lovely idea I would like it for myself! It's very pretty and I would give it to my Mum. This very generous prize would have to be given to my sister. is it wrong but i want it for me! I would give this to my niece to mark the birth of her first daughter. It's such a beautiful, unique bracelet. I'd give it to my sister to tell her how much I love her. Never knew this before brand this post and i'm so happy to discover it thanks to this blog! I think it's a really special way to thank someone close to you. I'd give it to my mom, can't thank her enough! I would love to give this to my daughter to have the birth-dates of my 2 grandsons put on it. gorgeous, id give it to my partner. I love the bracelet; it's unusual. If I won, I'd give the bracelet to my daughter in law. id give this to my mum because shes the best! I think it is beautiful, and think my mum would love the idea but not really her style so I'd be mean and have it for myself from my daughter. This is just so gorgeous that I would have to keep it for myself! It would make a lovely gift for my girlfriend so i could show her how much i love her! It is such a gorgeous bracelet - probably my mum. She would love it. I would love to win as it's such a nice design and would make a lovely personalised trinket. If I won I'd have to give it to myself! I'd love this as a present for myself from the kids - they're 6 and 4 so they can't really go Christmas shopping yet. Well, that's my excuse!